Double digging may be hard work but it is perfect for creating new borders and deepening shallow topsoil. Double digging is a useful way of cultivating soil in new gardens and in situations where deep topsoil is required. Ordinary digging is good enough for most circumstances. Choose double digging over other methods of soil cultivation where the soil is compacted, where ground has not been previously cultivated, where demanding long-term plants such as asparagus are planned or when making raised beds. All bare ground is suitable for double digging. It is not necessary to double dig every year, but on poor or heavy soils and in vegetable gardens it may be needed every three to five years. Otherwise borders only need double digging at their creation and on total replanting. Double digging is ideally done in autumn and winter when the ground is moist, but not waterlogged or frozen. The ground then has time to settle after digging and, on heavy soils, for the frost to break down the clods before planting in spring. If the soil conditions are good, then double digging can be carried out any time of year. Allow the soil to settle before planting. If dug in autumn, this usually happens naturally by spring. But if the soil is still very soft, lightly tread the plot first. 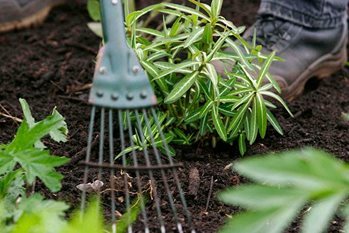 Double digging is not always necessary and if time and physical strength prevent this very hard work, be aware that ordinary soil cultivation is often good enough, or else you can make raised beds or control weeds with weedkillers.